You all know how much I enjoy fresh cut flowers. Roses are by far my favorite cut flowers along with hydrangeas and lilacs. But this time of the year my limelight hydrangea bushes are in full bloom. They are finally at their peak and showing off soft pinks and greens which is my favorite color combination. I started cutting my blooms off to enjoy in my home. 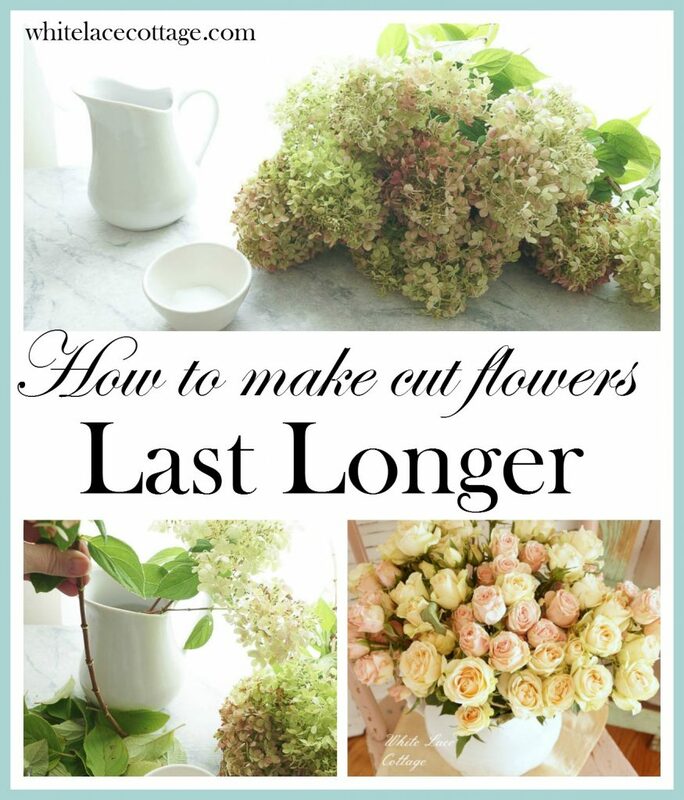 Often I’m asked how to extend the life of cut flowers and today I am going to share that with you. 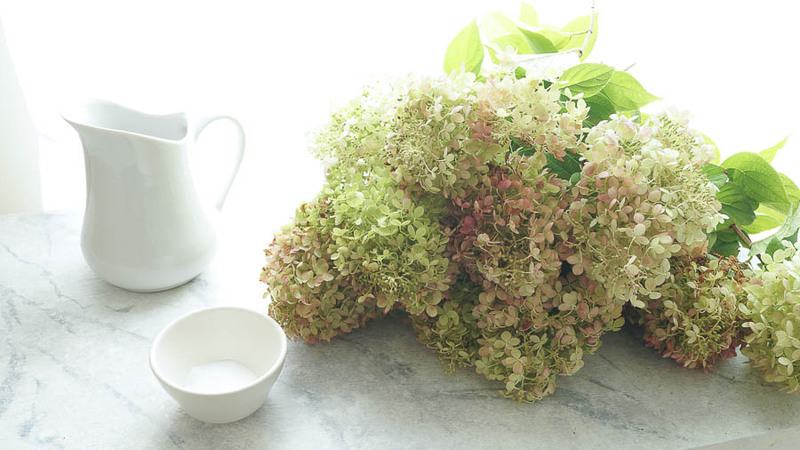 Let’s talk about hydrangea’s first. After cutting these off the bush, I shake them gently outside before I bring them in. These can carry little spiders and pests, and I like to keep those outdoors. Once inside, I grab a pitcher and fill it up with spring water. I have soft water, so I can’t use these for my flowers. If you don’t have soft water, then you can use tap water. I pull out my alum powder and add some to a small bowl. What’s alum powder and where do I get it? Alum powder is a crystalline powder, it’s used as a food additive that works as a firming agent. You can find this at your grocery store here in the states. First I take most of the leaves off of my branch. If the leaves sit in water, it starts to form a bacteria that can kill your flower, and really makes the smell of the water horrible, like rotten eggs….yuck! Then I decide how tall you want your flowers to stand once they are in your pitcher or vase. Hold the stem next to your pitcher then I cut it on a 45 degree angle. 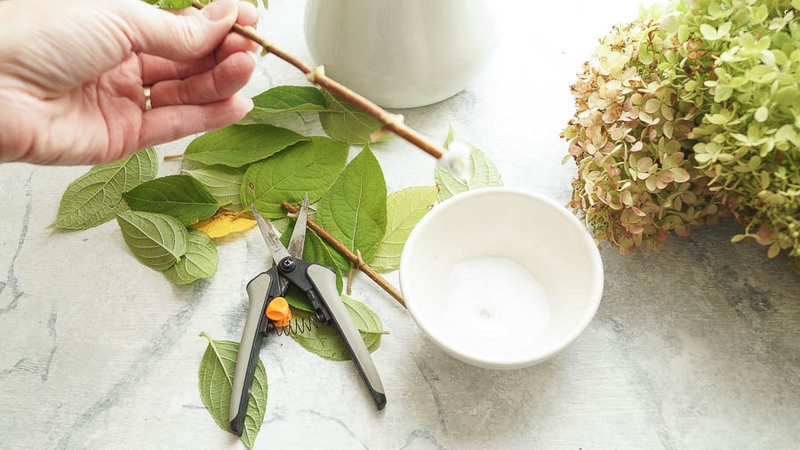 Cutting it on an angle will help the flower to absorb the water. Next, I dip the bottom of the stem that’s in the water of my pitcher, then I take that stem and dip it the alum powder. After you dip your end in the alum powder, place it in the pitcher. Some of the alum powder will fall off when placed in the water, but some will stay on your branch. This will help preserve your cut flowers . Now if you are doing this at the end of the season, when they start turning colors, and you leave them in water, they will start to dry nicely. 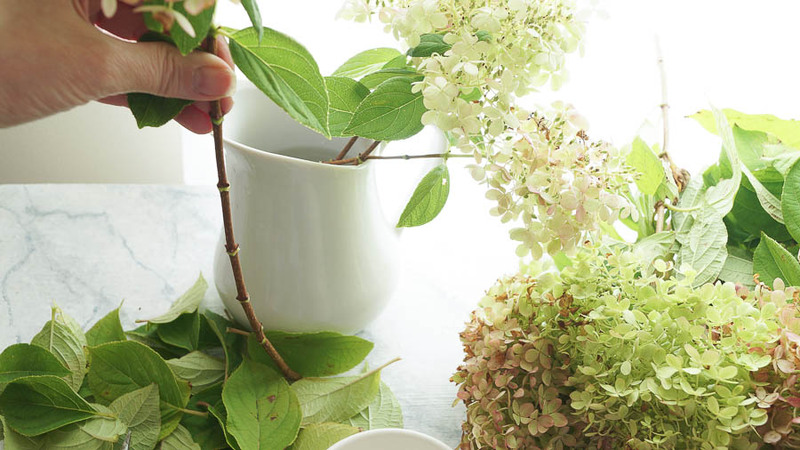 This works to preserve and dry your hydrangeas. You may have to change the water after a week or so. Keep working until I fill your pitcher is filled. 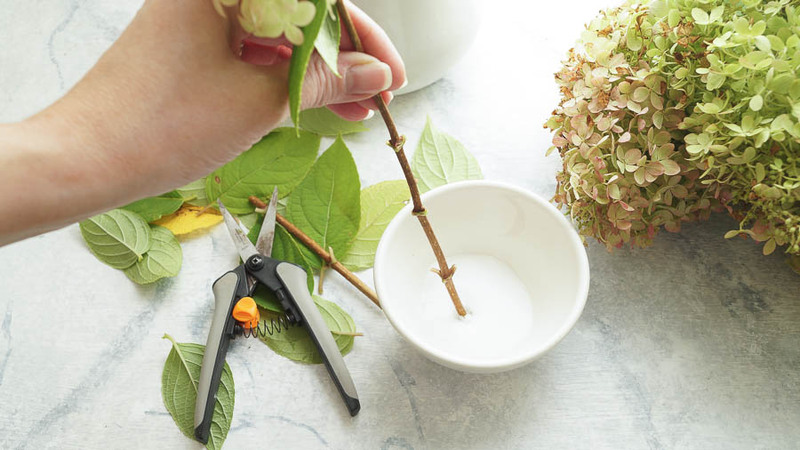 Let’s talk about how to extend the life of roses. My fresh roses always have a small pack tucked inside that helps preserve them. I fill up my pitcher with spring water, and had just a tad of that preservative. I’ve been doing this for years. But I was curious as to what’s inside that packet, and how can you preserve your roses from your garden. Those packets contain nutrients for the flowers. I was told those packets contain an acid, a biocide (such as a bleach), that destroys bacteria along with sugar to help preserve and extend the life of fresh cut rose. I’ve also heard that vinegar, wine, pennies and asprin does not make your roses last longer. I’ve actually killed mine when I used asprin. So, besides using those packets, what works? One way to preserve your roses is to use sprite or 7-up, but don’t use diet, use regular. 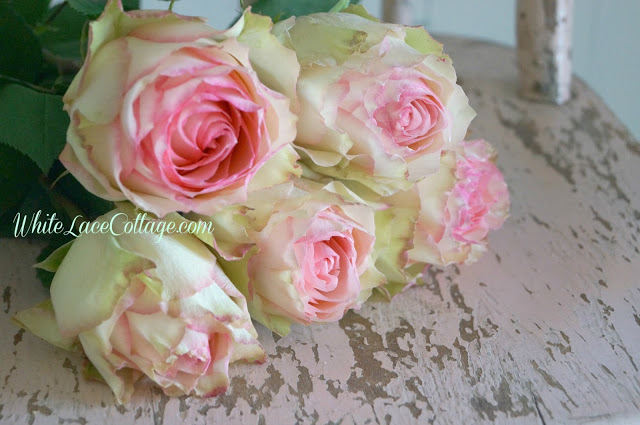 The sugar and acidity in the soft drinks help to prolong the life of roses. Mix 1 part sprite or 7-up soda with 3 parts water. You can add 1/4 teaspoon of Chlorox bleach, it will keep the water clear. Make sure to cut your roses on a 45 degree angle and cut off any extra leaves so they are not in the water. You can also preserve your roses by using real lemon juice. Mix 2 tablespoons along with 1 tablespoon of sugar, and 1/4 teaspoon of Chlorox bleach in warm water. You can add 1/4 teaspoon of bleach to your vase every 4 days. 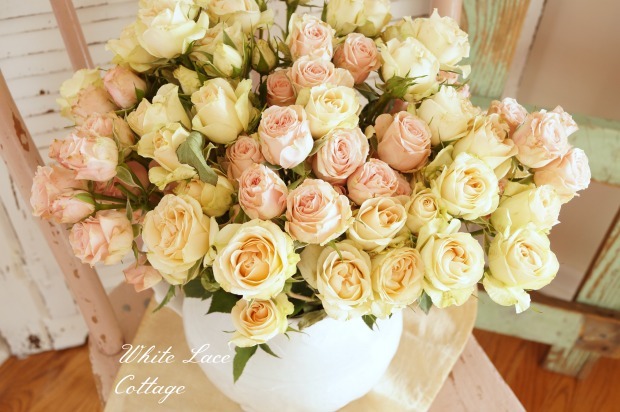 Do you enjoy adding fresh cut flowers to your home? Which are your favorite flowers? Thanks Laurie, Oh I agree, you can never have to many roses! 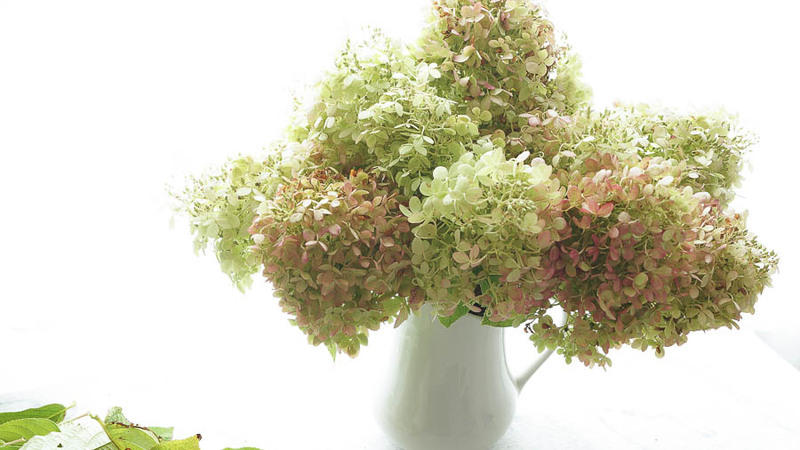 I’m so envious of your limelight hydrangeas. Hard to grow them in Wyoming, although I had one big bush in the house I sold recently and couldn’t move it. May need to find one online for new location. Thanks for the tips….I, too, always wondered what is in those little packets in flowers from the store. Awe that’s too bad Cheryl! I have two other hydrangea bushes, but I didn’t get anything at all this year from those. Only an abundance from my limelight. Thanks Anne this is certainly something that we all need to know and to do it right. I love roses and hydrangeas. Your welcome Marlene, you know how much I adore these flowers. It’s good to know how to make them last a little longer. Have hard time growing flowers in our yard, too dry and too much alkali. Hubs is on back deck cleaning out vacuums really well. We have so much dirt here and with dog/cat shedding try to keep vacuums in decent shape. Especially from our dog who seems to shed all year, eeekkk. I use one of those little stick vacs on bare floors, not so darned heavy or hard to move like our shark but not as good on carpet. as shark. For some reason have just never cared for roses, love tulips, hydrangeas, dafodils/tete-a-tates. which grow wild in KY. Thanks for great tips. Have wonderful rest of week.